Beer that carries this symbol has been brewed in a genuinely Independent Irish Microbrewery. The ICBI launched the official symbol for independently brewed Irish craft beer within the brewing community in late 2016. Now that it is widely in use, in 2019 we're launching it to the public. The symbol differentiates authentic Irish craft beer among a sea of imitators. 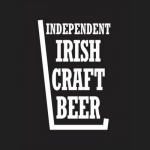 The Independent Irish Craft Beer symbol offers you reassurance that the beer displaying this symbol is from an independently owned, small scale, registered microbrewery and that the brewer has complete ownership of the brand. What the symbol means for you as a consumer. There has been incredible growth in the beer market, in Ireland with in excess of 80 registered microbreweries now in operation when a little as eight years ago there were less than 20! This is a fantastic news story for the consumer, leading to a really great choice of beers on the Irish market. But, along with the beers, we've found that craft beer drinkers also love the names and stories behind the breweries, and the link to their local community brewers. Unfortunately, some companies have released products into the market which have been misrepresented as craft beer, and have vague origins, but suggest a provenance of craft beer from an independent Irish brewery. There's even a new name for these types of beers, dubbed as "crafty"! The Independent Irish Craft Beer symbol offers reassurance to consumers that the beer they are buying is what it purports to be - that the brewery the beer came from is independently owned and small scale, a registered microbrewery (as recognised by Revenue's definitions), and that the brewer has complete ownership of the brand. What this means for the consumer is that they can easily identify a beer which comes from an independent Irish craft brewer and make an informed choice, based on the provenance of the beer. For the Irish craft brewers, it gives a means by which they can take a stand against the misrepresentation of brands and to identify themselves as what they are - small scale breweries, brewing their own beers in their own microbreweries. The Independent Irish Craft Beer symbol had been devised and developed by ICBI, however use of the symbol is not confined to ICBI members. Any brewer whose beer fulfils the criteria may submit an application for use. Use of the symbol is reviewed regularly by the review panel, who approve applications and address any complaints concerning use of the symbol. Use of the symbol is continuously managed through spot checks on the marketplace and via a complaints system where members of the public or brewers may contact ICBI with complaints about any beer which it is felt bears the symbol deceptively. The applicant company must have a current Brewers Manufacturers License from Revenue.